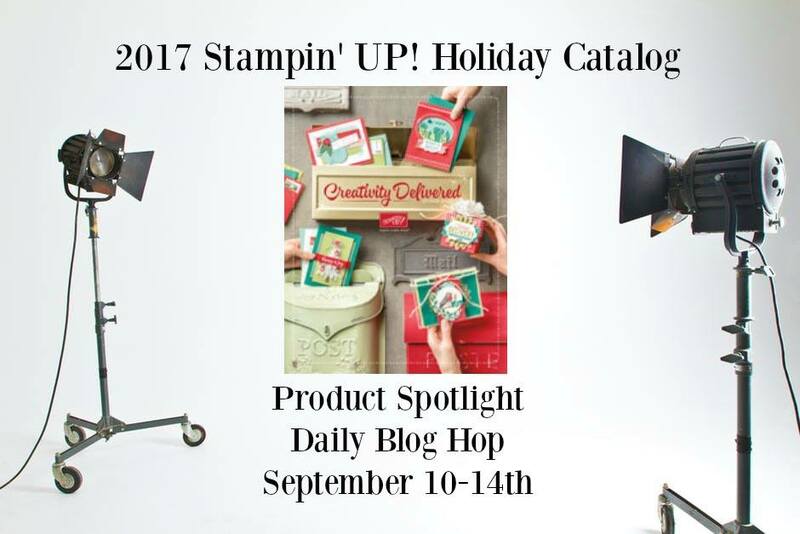 Today is the 4th installment in our 5-day 2017 Holiday Catalog Product Spotlight. Have you seen anything yet that you just loved? I sure have. I will be CASE-ing a bunch of them! There are some very talented Stampers here! So today, We are here to talk TEST TUBES! When I told my husband I needed some candy for test tubes, he was very puzzled. He thought I was doing something with my daughter for her science class. He just has no clue that TEST TUBES aren’t just for science anymore. They are a great way to give a treat! What you can do with them is really only limited to what you can fit inside them. This is your typical hot chocolate packet simply dumped into one of the test tubes. 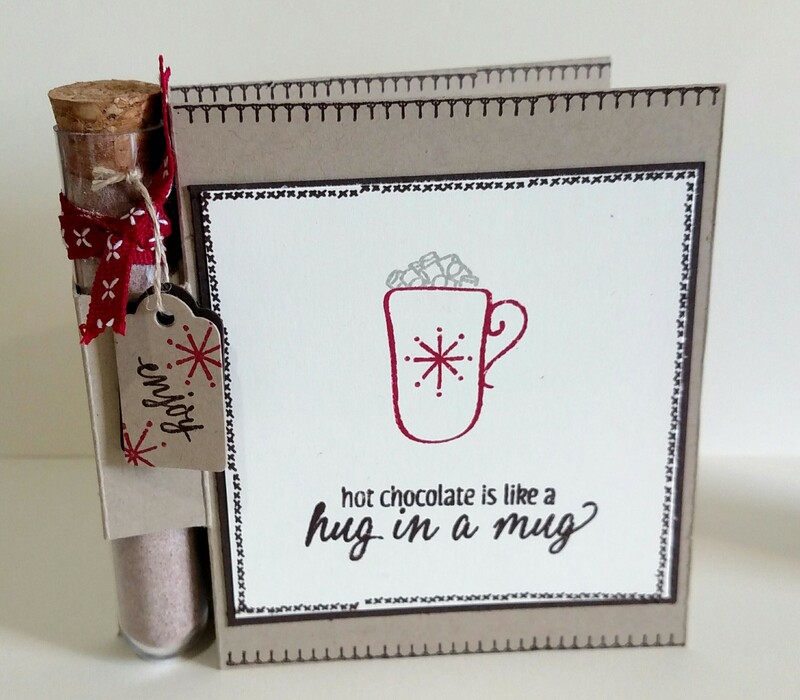 I created a card for it using the Hug in a Mug Stamp Set (144933). I cut the little tag using the Wood Crate Framelits (143730). Lemon Heads candy fits nicely into the tube for someone that you want to give a little sour too. 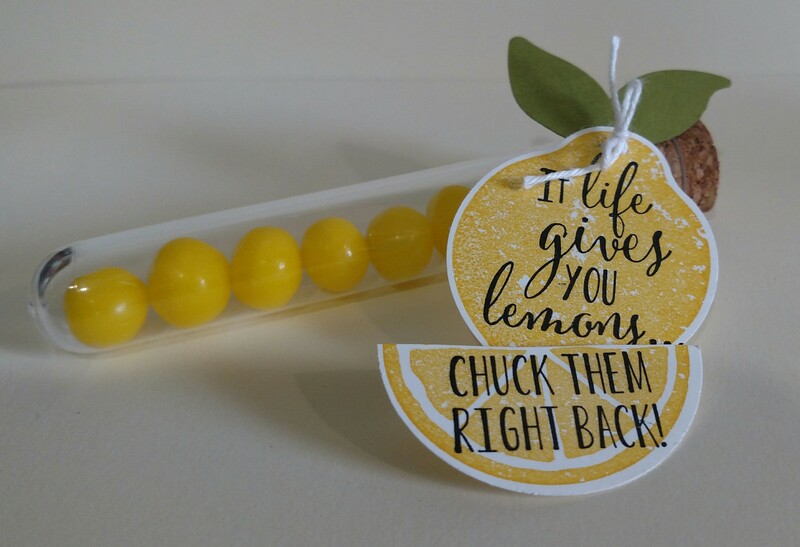 I used the Lemon Zest Bundle (145359/145360) to make the tag. This bundle includes the Lemon Zest Stamp Set (143805/143808) and the Lemon Build Punch (143712). If it fits… it can be a treat! Here are a couple cough drops and a little tag for a friend who has a cold. The tag is from the Here For You stamp set (141541/142164) and cut out with the Classic Label Punch (141491). A little fire starting kit. I grabs some pine needles and twigs off the ground outside my craft room to put in the test tube then slipped in a couple matches. On the top of the cork, I glues a small circle of sand paper so you can light the match. 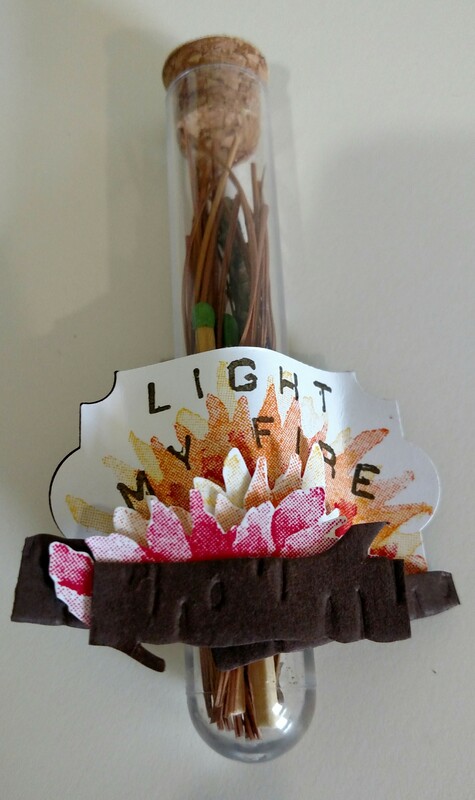 The fire on the tag was created using the Painted Harvest (144783)flowers in Crushed Curry, Pumpkin Pie and Real Red. The logs were embossed using the Woodland Textured Impression Embossing Folder (139673) then fussy cut. The wording was created using the Little Labeler Alphabet Stamp Set (141936). And, I used the new Everyday Label Punch (144668) to make the stand. I cut two pieces and glued the tips together then slipped the tube in between after it dried. Hope you enjoyed what you see here! Now, hop on over to Jennifer Van Wart or hop back to Janet Wakeland! These are BRILLIANT 🙂 !!!!!! Love these! Really great ideas! Each one of these is awesome! Love all the decorating of the tubes!